A US court has banned the sales of Samsung's Galaxy Tab 10.1 tablet until a decision is reached regarding the South Korean electronics giant's patent dispute with Apple. The two companies have been locked in multiple legal battles across the globe with mixed success for both sides. US District Judge Lucky Koh, who has presided over the majority of the two firms' court appearances, originally denied Apple's request to halt sales of Samsung's tablet. Unrelenting, Apple then took the matter to the Federal Appeals Court, who in turn instructed Judge Koh to reconsider her decision. "Although Samsung has a right to compete, it does not have a right to compete unfairly, by flooding the market with infringing products," Judge Koh wrote on Tuesday. She also added that the order would come into effect once Apple posted a $2.6 million bond to protect against damages suffered by Samsung should the injunction later be overturned. Samsung said in a statement to Reuters that retailers would still be able to "clear existing Tab 10.1 inventories" and whilst they plan to appeal to the Federal Appeals Court in Washington DC, they didn't think it would have a major effect on its business. "Apple sought a preliminary injunction of Samsung's Galaxy Tab 10.1, based on a single design patent that addressed just one aspect of the product's overall design," Samsung said in a statement. "Should Apple continue to make legal claims based on such a generic design patent, design innovation and progress in the industry could be restricted." Interestingly, Samsung released an upgraded Galaxy Tab 10.1 II to the market last month, which is not currently subject to the sales ban -- for the moment at least, which is perhaps why Samsung doesn't feel its business is under threat. "The relief being given to Apple here is extraordinary. Preliminary injunctions are rarely asked for and rarely granted," said Professor Colleen Chien of Santa Clara Law in Silicon Valley. "That this was a design patent and copying was alleged distinguish this case from plain vanilla utility patent cases. Cases involving these kinds of patents are based more on a counterfeiting theory than a competition theory, so I don't expect this case to have ramifications for all smartphone disputes, but rather those involving design patents and the kind of product resemblance we had here." 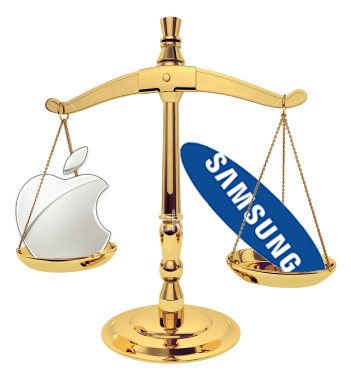 The move follows another ruling a week ago, in which the Netherlands' District Court of The Hague favored Samsung. This ruling was in relation to Samsung's claims that Apple infringed on patent EP1188269, relating to 3G technology used in its iPhone 3, 3GS, and 4 as well as its iPad 1 and 2. Apple had little to say on the matter, besides reiterating previous statements that "blatant copying" was wrong.